Here in East Tennessee, we are lucky to have a vast majority of fishing options within a short drive. Because of the diversity of fishing conditions, finding the right type of wading boot is one of the toughest decisions that an East Tennessee Angler has to make. For the past 6 months, I’ve been wearing a pair of versatile boots that can make the decision a little easier. For starters, I am convinced that the Smoky Mountains are the slickest place on the planet to try and catch a trout. Anyone that has tried to navigate the angled, Vaseline-covered ice sheets of bedrock in Abrams Creek knows exactly what I’m talking about. For that reason, I would venture to say that at least 90% of anglers in the Smokies wear felt-soled wading boots. A big portion of our customers like to hike way into the backcountry to fish (I’m looking at you James Locke and Mr. Medlen). Not only can hiking in your felt boots reduce their lifespan, I have found that it also fills the felt with dirt and then compresses it to make a surface much slicker than clean felt. For that reason, some guys will walk into their favorite backcountry stream wearing hiking boots, and then fill their backpack with their felt-soled wading boots. For all of you tailwater fisherman, the bottom of your rivers can be a bit more forgiving, but I would be lying if I said I hadn’t slipped and filled my waders with frigid water from the Clinch. As some of you know, the Clinch River has Didymo, also known as “rock snot”, and the Smoky Mountains do not. The jury is still out on what actually causes Didymo to show up in a river. Prevention is the best medicine, and regardless of what you have read, I think we should all take the cautious road and make sure that we are doing our best to prevent the spread of organisms from one stream to another, but that is a topic for another day. Many tailwater anglers opt for rubber-soled wading boots. Studs are becoming more and more popular, and all I will say about studs on a wading boot is, “don’t knock it until you try it”. I was pleasantly surprised the first time I added studs to a pair of felt wading boots. To make matters more complicated, a lot of fisherman enjoy fishing out of a boat; whether they are floating in a drifter or raft, or chasing warmwater fish on the lakes. I fish out of a boat quite a bit in the winter time, but I’m sure my invites to go float with my buddies would decline sharply if I took a few steps into their boats with studded boots. It is a pain having to remove and replace studs every time I get in a boat in the winter. When choosing footwear, additional consideration must also be taken by the traveling angler. As some of you know, felt soles are currently banned in 7 states in the U.S., including the popular fly fishing states of Alaska and Vermont. With all that being said, for the past 6 months I have been wearing a pair of boots made by Korkers. 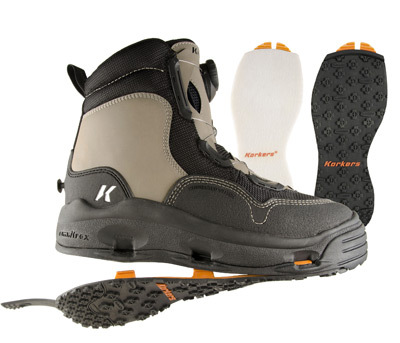 Korkers came onto the scene years ago with their revolutionary system of being able to change the soles on your wading boots. What a great idea! However, for a period of time, the usefulness of the system was overshadowed by what some would call “sub-par quality”. After all, the fly fishing industry has spent years and years trying to figure out how to make sure that the soles don’t fall off of a wading boot at the most inappropriate time. Surely there would be some complications from trying to create a system sturdy enough for hiking and rock hopping, but also simple enough to switch out the soles quickly and easily. After years of work, it seems that Korkers has worked out the kinks in their boot design. Early in the summer, our Korkers rep James Buice was in town and showed us the new and improved Korkers lineup. I was immediately impressed. Their new slogan is “more durable, more technical, more effective”, and I can’t say that I disagree. I got my hands on a pair of the Korkers Whitehorse boots, and I haven’t looked back. These boots, along with all Korkers boots, come out of the box with 2 sets of soles: one pair of felt soles and one pair of “Kling-on” Rubber soles. The soles are extremely quick to change and I can change both boots in just a couple minutes. There’s no tool to keep up with and no complicated system. Just pop the sturdy rubber tab on the back of the boot, and the soles pop off with a little elbow grease. Slide the new ones on, click them into place, and off you go. Now, let’s talk about durability. For starters, these boots just feel sturdy. 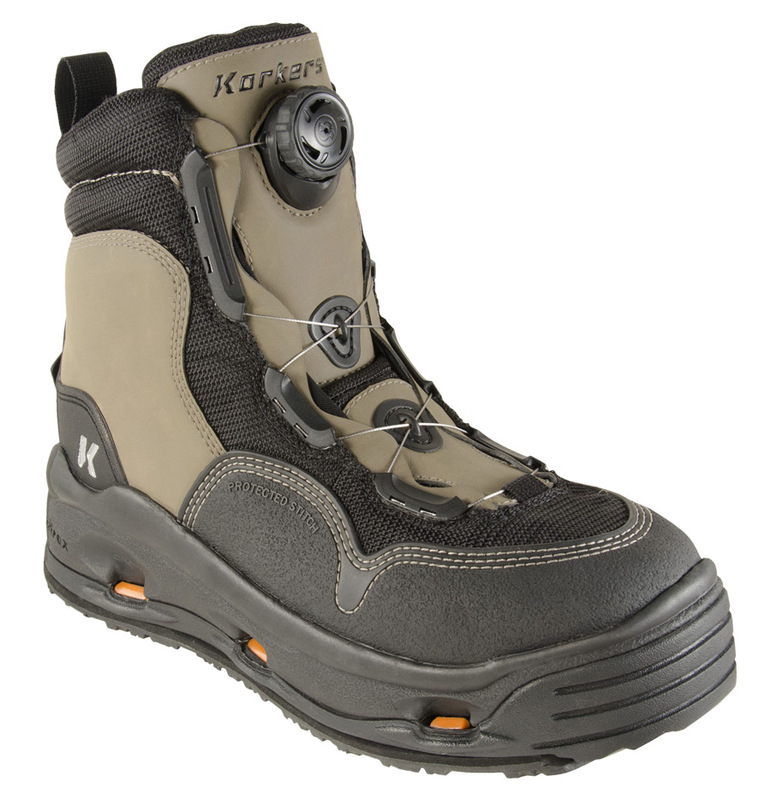 In order to prevent damage from abrasion on rocks, Korkers extended the molded toe cap to come way up the boot. Everything is triple stitched, and the stiches on the upper are recessed down into the material to keep them hidden from sharp rocks and sticks. They have also reinforced the “crease line” on the front of the boot that seems to be the source of so many issues on any type of shoe. Should something go wrong with your boots, Korkers will fix them for free for any reason within one year of purchase. After a year has passed, they handle each repair issue on a case by case basis. As far as comfort goes, these boots feel much more like an agile hiking boot than a clunky wading boot. They are light, comfortable, supportive, and sturdy. The Whitehorse boots also feature the innovative M2 Boa Lacing System. This is a dependable alternative to shoe laces and is extremely quick when putting the boots on or off. Just a few quick turns of the knob and your boots are snug. Once you walk a bit, if the fabric settles, turn the reel a few more times and your boots will stay snug all day long, without the hassle of tangling your fly line in your laces or your boots coming untied. All Korkers boots have a draining system that allows almost immediate drainage out of the sole once you step out of the water. This keeps the weight of the boot light so that you don’t exhaust yourself by carrying around heavy, water-logged boots all day. The boot materials are also hydrophobic, allowing for much quicker drying times. Quicker drying times are thought to help prevent the spread of invasive species. Dryer boots also make it easier and lighter to travel once you are headed back home, whether that involves a quick ride in the truck or a long plane ride. I’ve used the felt for slick Smallmouth streams on the Plateau and for trout streams in both East Tennessee and British Columbia. For added traction, I bought a pair of the studded felt that works great in the slickest streams in the Smokies. I’ve popped the studded felt off, put the rubber soles on, and hiked long distances for a day of fishing in the backcountry. I’ve worn them in my boat when the water is a little too chilly to launch in flip flops. Heck, I even slapped the rubber soles on and wore them and my waders to a rainy game at Neyland Stadium. I got some weird looks, but I stayed dry in my waders and had a comfortable shoe to walk around in all evening. These boots are the definition of versatility. Though I’ve only worn them for 6 months, I have used them hard and often and can honestly say that some boots would’ve already kicked the bucket. These boots show no signs of failure and I feel like I will get quite a bit more time out of them. As I mentioned earlier, the boots come out of the box with both felt and rubber soles. Other options available for purchase include 3 different studded rubber options and studded felt, among others. We carry 3 styles of boots in the shop for all price ranges. Stop by on your way to the mountains to take a look at these boots!